Science is Boring when it’s read, but it’s completely fun when you do the experiments with your own hands ! Here I am starting a series called ‘Fun with Science’ and this is my First experiment post for you….. 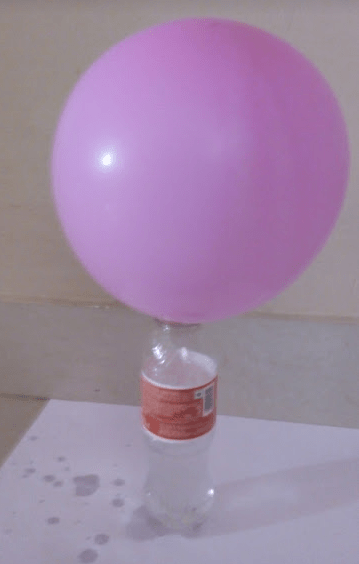 Blowing Balloons are always fun, but this time let’s give a break to blowing by mouth and give a chance to Vinegar and Baking soda to do the job……..
Next wait and watch how balloon blows up by itself ! Why does the balloon blow up ? 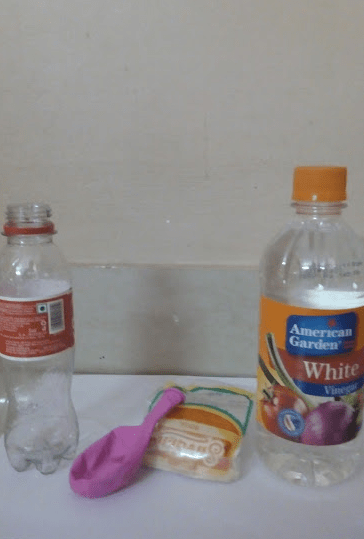 Adding vinegar to the Baking soda creates a chemical reaction. The Baking soda is a base, while the vinegar is an acid. When the two combine they create carbon dioxide (CO2). 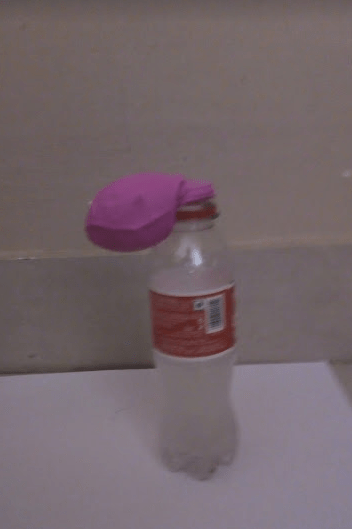 The gas rises up and tries to escape through the soft drink bottle. Since the exit is sealed with balloon, the gas escapes into the balloon and blows it up. In case you don’t have any vinegar then you can substitute the vinegar with lemon juice. My kids loved this experiment. I am sure your kids too would love it….So try it out. Will soon post the next experiment….Till then have FUN! Super fun. My son did this at his science fair this past year. He loved learning the reaction between acids and bases. Wow, I love it! Will have to do this experiment at home this week while the kids have one more week off from school. My favorite part of Science was always the Science experiments! This will be so fun to do with my kiddos! This is so cool! I’m going to make this with my girls!!! Looks like so much fun! I’ve seen videos of this experiment. This will definitely be fun for kids. Wow superb article. This looks like a fun loving activity. I will try this. Its interesting too. My son is only 3yrs old right now but i am sure he would love it when he grows up..
Fun experiment, totally agree with you that when you apply science practically, it provides fun. fantabulous idea.. My daughter is crazy about balloons and its difficult for me to blow them every now and then. I will teach her this in my supervision. What a lovely experiment, you are true the interest get piqued up seeing all these lovely fun experiments. Will try this with my 5 yr old. Thank You for sharing.